Recognized as the “most epic canoe-a-thon” yet, 45 Messiah students, parents and trip leaders embarked on a 20-mile journey down the yellow breeches this past Saturday. “The Canoe-a-thon is an annual event that involves a 20 mile-long canoe trip down the Yellow Breeches to the Susquehanna River to raise money to fund students doing missions in the summer,” as described on the messiah.edu webpage. This year’s Canoe-a-thon marked the 40th anniversary of the event, helping to raise money for grants which allow students to go on individual mission trips. 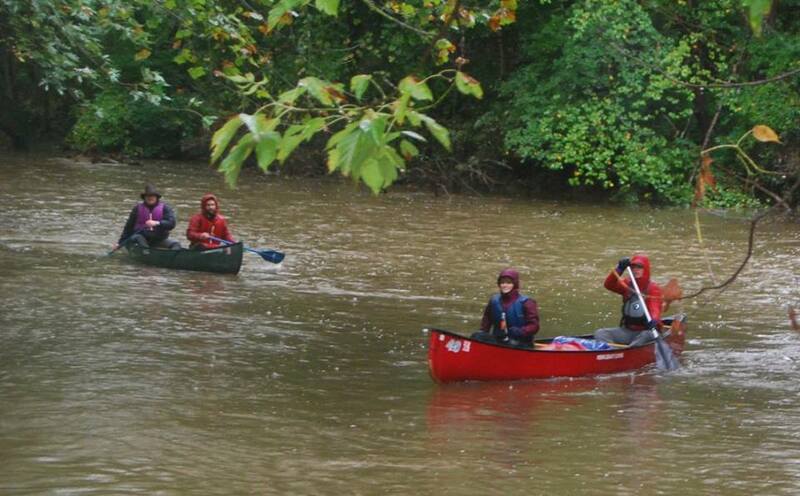 With temperatures barely reaching 50 degrees throughout the day and endless rain from Hurricane Joaquin, Wendell Witter, Assistant Director of Student Involvement and Leadership Development at Messiah College, expressed how he’s never lead a Canoe-a-Thon with this type of weather. There’s been rain and cold weather, but never together as it was on Saturday. The weather put the trip leaders, including the Loft team, on high alert throughout the day. Participants were instructed to layer, coming prepared for rain and staying precautionary throughout the day as unpredictable weather may cause a change in plans. The weather also played a big role in the experience created for individuals. “The hurricane weather proved to be a worthy component,” says junior Austin Burbank who lost his favorite hat to the storm during his journey. But he went on to say, “laughs were had,” which seemed to ring true for many members of the trip. With multiple flipped canoes throughout the trip, frozen fingers and smiling faces, this years’ Canoe-a-thon ended just short of the Susquehanna River, where water levels were too dangerous to take on.